A 1' long USB 2.0 cable is also included to connect the CamRanger to your DSLR. 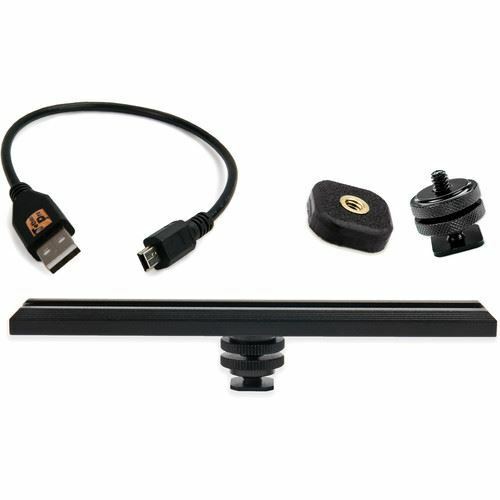 The length of the cable as well as the size and strength of the extension bar and mounts provide the ideal distance between camera and a CamRanger, avoiding dangling cables as well as potential damage caused by impact. The black Tether Tools TetherPro USB 2.0 Type-A to 5-Pin Mini-USB cable is 1' long and has gold plated connectors that provide consistent and reliable conductivity as well as corrosion resistance. The ends of this cable feature a standard USB Type-A male connector and the other side is outfitted with a 5-pin mini-B male plug, which is compatible with most digital cameras. Box Dimensions (LxWxH) 7.0 x 6.2 x 0.4"